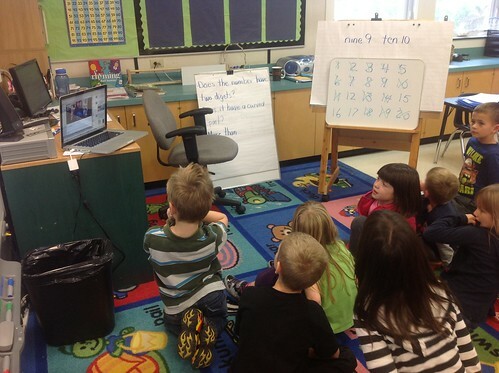 Ms. Lirenman’s class in Surrey, British Columbia, is also learning about numbers up to twenty, so my class challenged hers to a mystery number Skype. We chose a number between one and twenty and they tried to guess what our number was by asking questions that could be answered with a “yes” or a “no”. Their first question was, “Is it nine?” They were right! Then we tried to guess their secret number. We had previously played the mystery number game in our class, so we knew some “fat” questions to ask such as “Does it have two digits?” but sometimes the temptation to ask “Is it four?” was just too much to resist. Finally, after lots of work eliminating numbers, we guessed it. We also let them have another turn because they were finished their turn so quickly the first time. We had fun learning with your class, Ms. Lirenman! We hope we can do it again soon. I would love to do the same with you or another class. We are a K class in South Carolina! We would be happy to do it with you, but perhaps another kindergarten class might be better for you? I guess it would depend which numbers each class is working on. I bet that was a blast and a great way to make learning fun. I would be willing to do this with Mrs. Toler’s class. I teach kindergarten in Indiana. If you give me permission, I’ll send her your email address. Done! I’d love to hear how it goes. We loved playing this math game with you. We are practicing a little more so that we can do better next time. What you call “fat” questions, we call “juicy” ones. I really like the idea of connecting students from other countries using skype and blogs! I very much look forward to using this or something like it in my classroom!